The venerable retailer, which was located in Ontario from 1929 to 2015 before moving to Upland, is closing this summer. Also: Fox 11’s Matt Johnson reflects on his Ontario childhood, and more items from around the valley, in Sunday’s column. Column: Does each booth have a cone of silence? A rare (but welcome?) all-Ontario column begins with a Spires restaurant sign now missing a crucial letter, continues with a City Council meeting and concludes with TV filming and a robot. What more would you want in a Sunday column? That’s rhetorical. I follow up on my recent column on the young man from Ontario who was killed in Vietnam 50 years ago. His family and friends held a private graveside service for him and invited me. That story is Sunday’s column. An elderly reader made me chicken soup, while also packaging crackers, cookies and apples. Isn’t that sweet? It made for a nice item for Sunday’s column. Here’s the story of Antonino Ruggeri, a young man from Ontario who died in the Vietnam War. It came about like this: His sister phoned our newsroom and I picked up. She wanted a remembrance notice of some sort about her brother. She’d probably have been happy to buy an ad, but it seemed like a story I could do something with. We met at our office Jan. 28, I went home ill and pretty much stayed there for the next two weeks. But with Tuesday being the 50th anniversary of his death, I’m pleased to have this be Wednesday’s column, the first after my (semi-) return to work. A landmark plaque was placed on the downtown Ontario Post Office last week, and yours truly was there to learn more about the facility, as well as the twin murals inside. That’s the subject of Sunday’s column. Atlantic correspondent James Fallows and his wife, Deborah, visited a tech conference in Ontario on Wednesday to share what they learned from their travels through small-town America. They’ve produced a book, “Our Towns,” that goes into more detail, including chapters about Riverside, Redlands and San Bernardino. I write about their talk for my Friday column, while also including a bunch of Culture Corner items and a Valley Vignette. Anyone who wants an idea of what George Chaffey, the prime developer of Ontario and Upland, looked like has several options. Upland has a statue outside its city hall and Ontario’s airport has a relief inside Terminal 4. Both are by the late sculptor John Svenson. Ontario has a new Chaffey image outside the Senior Center, a bust that was dedicated in September. It, too, was by Svenson, who died in 2016. He produced a maquette and plaster cast of Chaffey. It was, coincidentally enough, prominent in a Bulletin portrait of Svenson in his studio in 1998 and reused in his obituary. His son, David, bronzed and finished the bust and spoke at the unveiling about his father’s passion for local history. 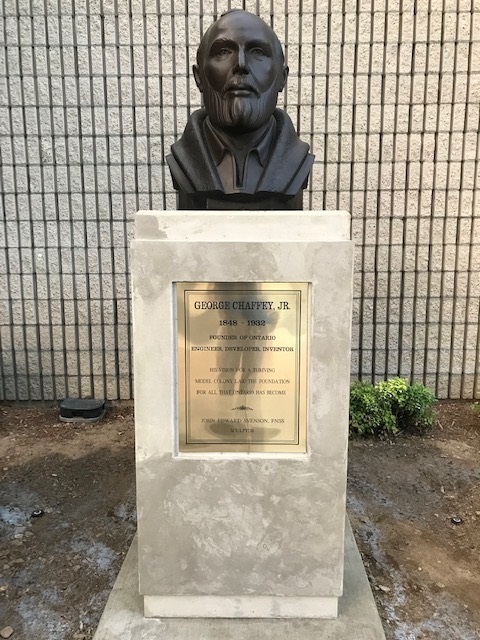 Having the piece in the Ontario Civic Center, steps from City Hall, is a welcome reminder to the community of Chaffey’s role in the city’s founding. Having heard it was there, I made sure to take a look, and a photo, on my most recent visit. Here’s a new, but perhaps not entirely unfamiliar, piece of art in downtown Ontario. It came about after the city’s arborist determined that an ash tree next to City Hall in the Conservation Park was past saving. 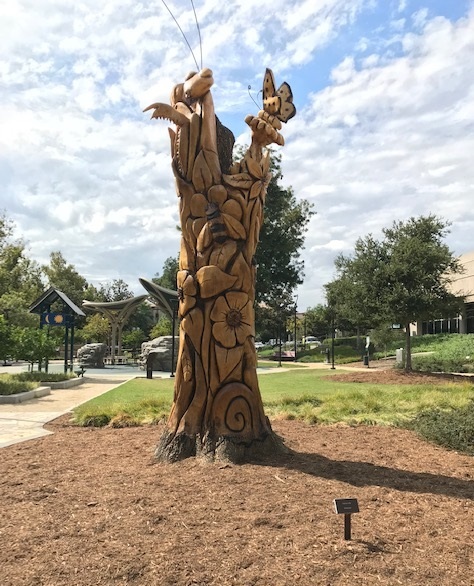 “Rather than cut it down, we commissioned an artist to create something in keeping with the Conservation Park,” assistant city manager Al Boling said. 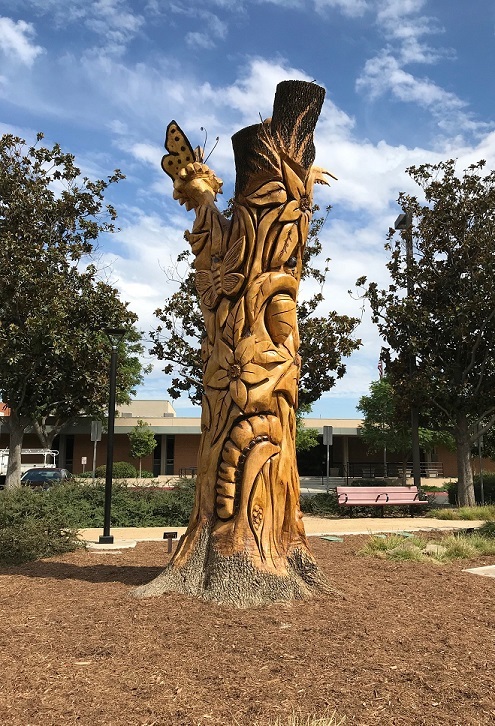 And so the tree was stripped of bark and limbs, and woodcarver Eric Garcia created “Shamel Ash” with chainsaw, hand tools and a blowtorch. The trunk now appears to be made up of flowers, butterflies, seeds, caterpillars and a praying mantis. Cost was under $5,000. The audience at Tuesday’s Ontario council meeting got a possible scoop as a slide of a planned freeway-visible sign for a big-box store showed the name IKEA. It’s likely to happen, city officials tell me. Also: cultural notes and more, all in Friday’s column.